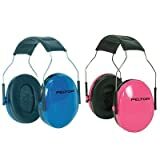 Editorial Reviews Amazon.com Peltor's dual cup, earmuff-style hearing protector is CSA approved. The twin cup design utilizes a hard plastic casing with soft ear molds to minimize resonance while achieving maximum high and low attenuation. The Peltor H10A provides effective, comfortable protection all day. 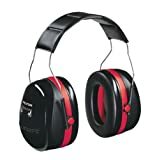 From the Manufacturer The Peltor H10A Professional Noise Canceling Earmuff dual cup patented Twin Cup design minimizes resonance achieving maximum high and low frequency attuation. This patented design provides the highest noise reduction rating for an earmuff tested in an approved laboratory. The H10A provides effective, lightweight, comfortable protection for noise levels up to 105 dB. CSA Class AL From the Manufacturer Peltor's dual cup design minimizes resonance to achieve maximum protection from high and low frequencies; muffling both the deep snorting of the backhoe and the high-pitched whine of the concrete saw. This patented design provides the highest noise reduction rating for earmuffs in its class. Lightweight and super comfortable, the H10A is designed to be worn all day.